Whew. I meant to post this days ago, but this week has been out of control! More about that when I do my SNAP Challenge week one summary on Monday. I loved the Soy Dijon Pork Tenderloin that I made ages ago and have wanted to use the same marinade for chicken for quite some time. Chicken thighs are cheap, so I figured that it might be a good cornerstone meal for the first week of my SNAP Challenge. The sweet-salty marinade was just as delicious as I remembered! To add a little extra flavor, nutrients, and bulk, I cubed a sweet potato and layered that in the roasting dish before adding the chicken and the marinade. The sweet potato added a nice sweetness to the dish and definitely helped keep me full. That was a good decision. I also doubled the marinade to provide plenty of sauce to cook the potatoes in, plus drizzle over the rice and vegetables that I served on the side. 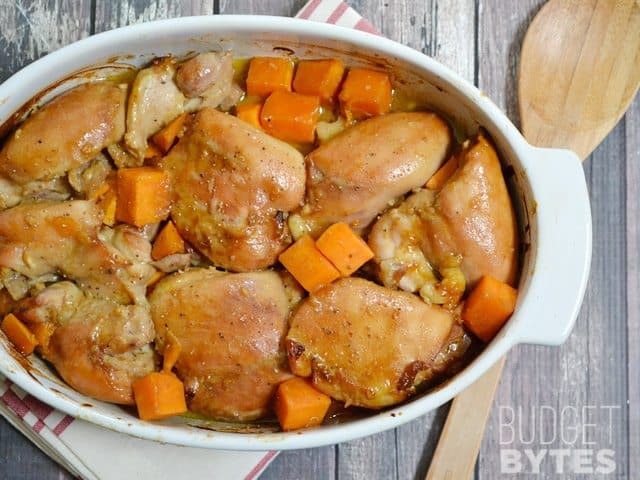 Soy Dijon Chicken Thighs are roasted together with cubed sweet potatoes for an easy, flavorful weeknight dinner. In a bowl, stir together the Dijon, soy sauce, vegetable oil, brown sugar, minced garlic, and some freshly cracked pepper. Add the chicken thighs to a large zip top bag or shallow dish, and then pour the prepared marinade over top. 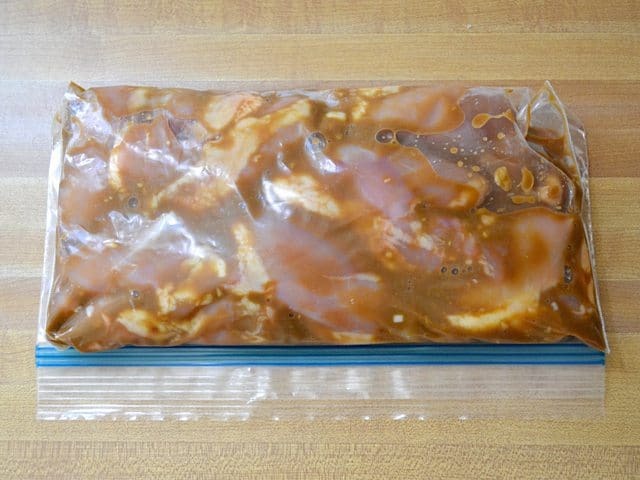 Refrigerate the marinating chicken for at least 30 minutes (can be prepared in the morning and refrigerated all day). When you're ready to cook, begin to preheat the oven to 375 degrees. Peel and cube the sweet potato into 3/4 inch pieces. 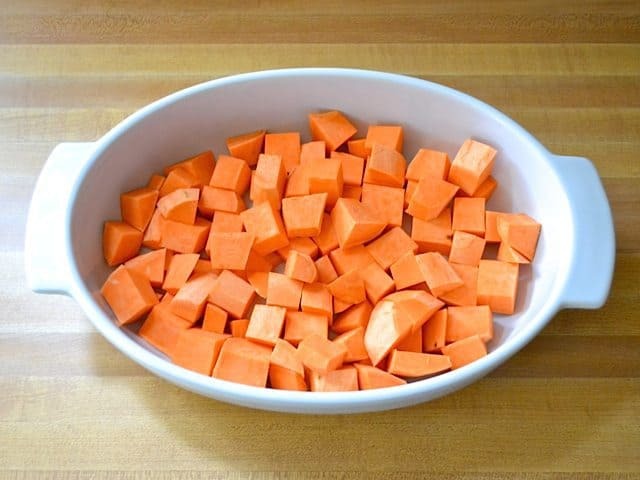 Lay the cubed sweet potato in the bottom of a casserole dish. 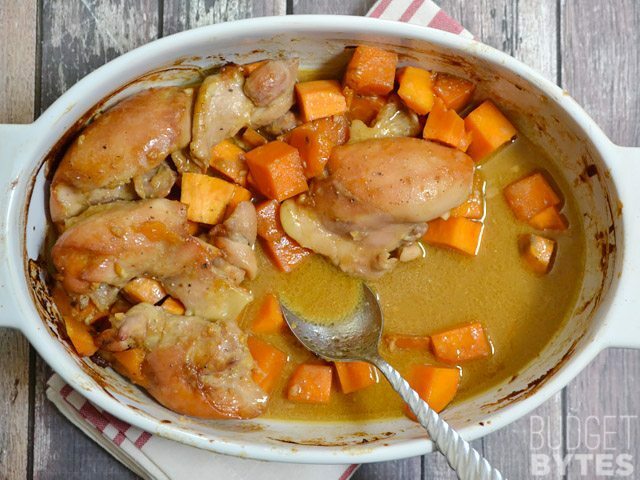 Lay the chicken thighs over the sweet potatoes and pour all of the marinade over top. Cover the dish with foil and roast in the preheated oven for 45 minutes, removing the foil after the first 30 minutes. After baking, spoon some of the liquid from the bottom of the dish over the chicken and serve. Use the extra juices from the bottom of the dish to spoon over rice and vegetables. 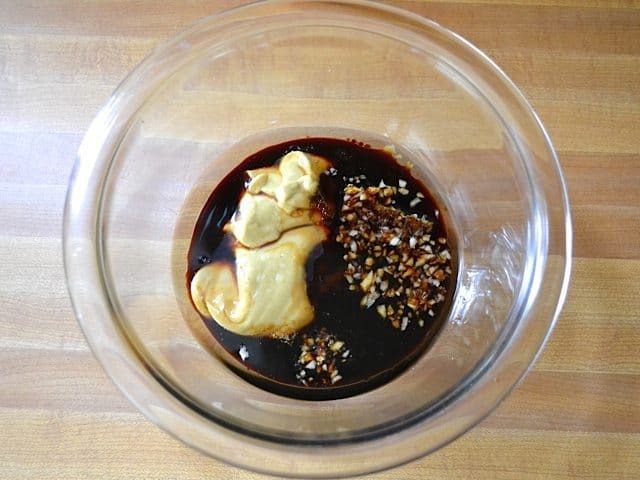 Prepare the marinade by stirring together 1/4 cup Dijon mustard, 1/4 cup soy sauce, 2 Tbsp vegetable oil, 2 Tbsp brown sugar, 2 cloves minced garlic, and some freshly cracked pepper. I used about 2 lbs. 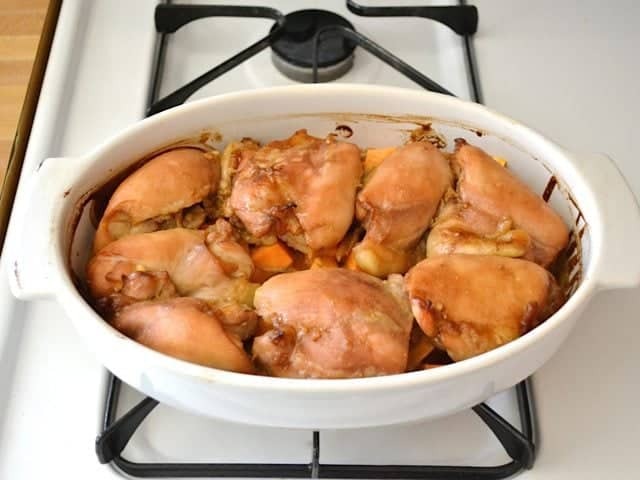 of chicken thighs, which was eight pieces. Two of the pieces were pretty small, so I counted those as one serving, for a total of 7 servings for this dish. Depending on the size of the thighs, you might get about 8 servings. 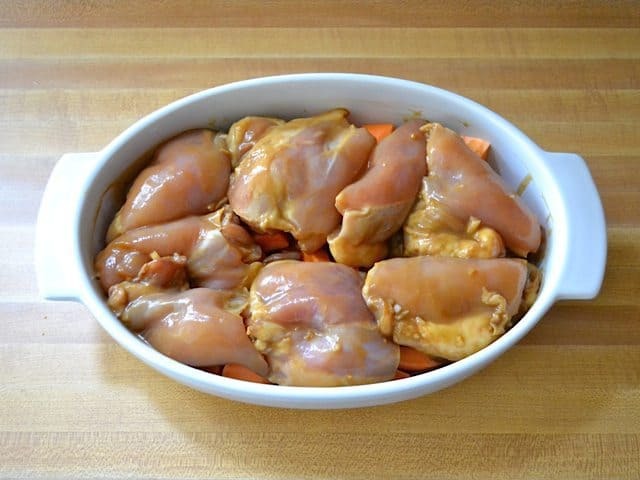 Add the chicken thighs and prepared marinade to a zip top bag or a shallow dish. 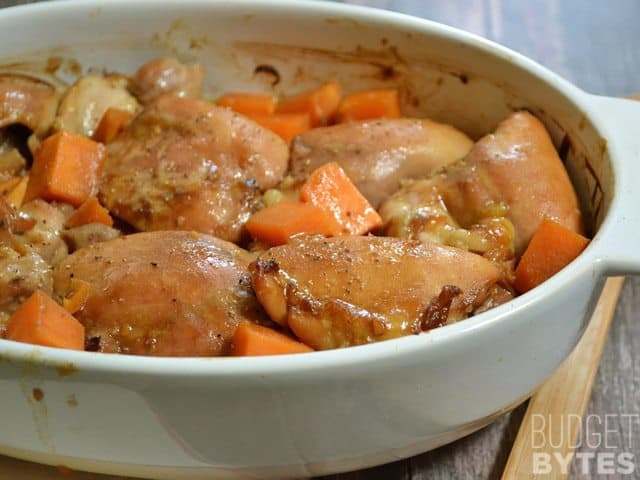 Refrigerate the chicken thighs as they marinate for at least 30 minutes. If preferred, you can mix up the marinade before work and let them marinate all day so it will be ready to cook when you get home. When you’re ready to start dinner, begin to preheat the oven to 375 degrees. Peel and cube one sweet potato (about 1 lb.) and lay the cubes in the bottom of a casserole dish. Cut the cubes into no larger than 3/4 inch pieces so that they cook through completely while in the oven. Lay the marinated chicken thighs over the sweet potatoes and pour ALL of the marinade over top. Cover the dish with foil and bake for 45 minutes. Remove the foil after the first 30 minutes to let the top brown. After it bakes, spoon some of the yummy juices over top of the chicken. Don’t let that delicious juice go to waste! I used mine to moisten and season the rice and vegetables that I served with the chicken. It’s SO good. Stay tuned to see how I worked this into my SNAP Challenge meal plan! I wonder is this could be made in a crock pot? This is great to freeze. Get your yuge cheap package of chicken thighs. Adjust the amount of marinade accordingly. Portion into freezer bags and marinate in fridge overnight for a quick-thaw, or freeze immediately if you plan on defrosting for over night. I usually cook the sweet potato separately, just my choice. The combo of the soy/dijon chicken and the sweet potato is totally yummy! Outstanding recipe! LOVE this recipe – easy, quick and DELICIOUS. Since all ovens differ, mine usually takes a bit longer to cook through the chicken completely. Also, the potatoes come out pretty hard if I put them in the oven raw, so I like to zap them in the microwave for about 90 seconds to two minutes before I cut them up. It softens them perfectly. This sauce is delicious and the cooking method works well. I was cooking about three and a half pounds so they needed an extra twenty minutes, covered, and I rearranged the pieces several times but they seemed just about right in the end. I doubled the marinade because I was cooking such a large amount but it turned out not to be necessary because the chicken threw a lot of liquid. I added an extra tablespoon of sugar because my mustard seemed sharp. I also added about a tablespoon of pressed garlic. Next time, I believe I may omit the extra sugar and cut back on the oil somewhat. It was quite rich, perhaps because that although the thighs were skinned, they still had some fat on them. I will also experiment with adding some seasoning, maybe some curry and cayenne. Good as is and definitely will make this again! 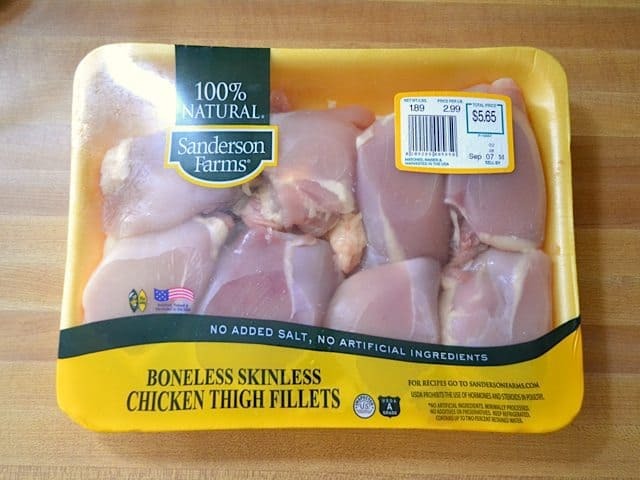 I’m not sure where you are shopping but I buy my chicken thighs for $.99 per pound which would save you $3.65 on your recipe. Sweet potatoes are also easily found cheaper. I shop Aldi and Wegmans. I WISH we had an Aldi here! I hear nothing but good things about it. :) Prices for chicken thighs vary quite a bit around here, so sometimes they’re super cheap and sometimes a bit pricier. Can winter squash replace sweet potato? Made this today and paired it with a side of asparagus, super flavorful too with the sweet potato. It took over an hour in my oven though… not sure if the glass dish I was using made it take longer? I did use 10 small thighs and 2 sweet potatoes so that could be why. Great recipe! Made this for dinner tonight. Didn’t have Dijon on hand. Used honey mustard instead. Still tasted pretty good, especially the sauce. I had to keep it in the oven for 70 mins though. Kept the skin and it was nicely crisp. Doubled the marinade as you said and it went great with rice.